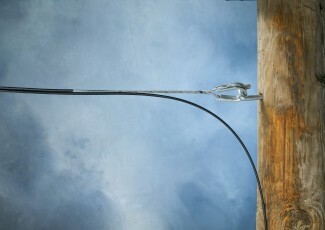 The FIBERLIGN® FIGURE 8 Drop Cable Dead-end has high strength in a light-weight package. Simple to install, the Dead-end is applied on the messenger component of the Figure 8 cable after separating the fiber component at the web. Depending on the jacket adherence, the Dead-end may be applied over the jacket or onto the bare messenger after the jacket is removed.